Down Goes Brown: Chris Kunitz: The man, the legend, the (sort of) cousin. Chris Kunitz: The man, the legend, the (sort of) cousin. I generally don't root for many non-Leafs. To be honest, I'd be perfectly happy if all 29 of the other teams' planes were involved in a fiery mid-air collision, since I'm pretty sure that in a league with only one team the Leafs would have a decent chance of making the conference finals. But I have a few exceptions, and one is for family. That's why I'll always support the Penguins winger Chris Kunitz. As the Official Cousin of DGB, Kunitz gets a steady dose of karma. After all, he has the same aunt and uncle as my wife. Or maybe it's a grandparent. Or something. I wasn't really paying attention. But the point is: We're practically brothers! So I do cheer for Chris Kunitz. And you know what? You should too. Because even if he's not vaguely kind of related to you, he has a lot going for him. Here's a list of some of the reasons you should join me in the unofficial Chris Kunitz appreciation society. Whenever he feels the need to "accidentally" stomp on the back of somebody's leg, is always considerate enough to minimize impact by choosing a player who couldn't possibly get any slower anyway. When playing Xbox at Sideny Crosby's place, he always makes sure to keep his voice down so that Old Man Lemieux doesn't come down and start yelling at everyone in his bathrobe again. As a practical joke while in Anaheim, once convinced Ryan Getzlaf not to bother shaving his head since the bald spot wasn't really all that noticeable. As a teenager, somehow managed to stay focused on his hockey development despite the many distractions and temptations available to a young man growing up in rural Saskatchewan. Wins the Stanley Cup pretty much every year. As part of expanding team leadership role, volunteered to explain to a confused Alexei Ponikarovsky that even though the regular season was over the team still had more games to play. Hockey historians believe his all-time NHL record for "most times being involved in a waiver claim involving the Anaheim Ducks and Atlanta Thrashers" may never be broken. Has never, as far as we know, ruptured anyone's testicle. If economists' worst fears are realized and the global economy spirals into a period of hyperinflation, eventually his $3.5M salary won't seem all that bad. Can't really prove this, but my guess is that he'd know how change a flat tire in less than 40 minutes. If the Penguins win another championship this year, he's privately pledged to receive the Stanley Cup, skate a few strides with it, and then immediately use it to beat Matt Cooke to death at center ice. You just know that he's eventually going to be responsible for the most memorable mispronunciation of Bob Cole's career. Once there was also a bug on Kimmo Timonen's face, so Chris Kunitz was kind enough to take it off for him. how about that time he selflessly performed unsolicited heimlich on semyon varlamov in the 2009 playoffs? too bad he couldn't stop the kid from choking in game 7. Does Regina still count as Rural? Everything in Regina is rural. DGB: Everything in Regina is rural. Please have Bob Cole say that too! Another reason: He went to college and took academics seriously, earning a degree in business from Ferris State University. He might be the smartest hockey player on the Penguins, except of course for Craig Adams who went to Harvard. "He might be the smartest hockey player on the Penguins, except of course for Craig Adams who went to Harvard." For sure, because like, unless you go to university, you're a complete tool with no brain. Like that Crosby guy, what a dope! Where's his lambskin? Dude hasn't proven anything! Tyler said... Does Regina still count as Rural? Surprised you have to even ask. How could anything that rhymes with V...ina not be considered rural? I was joking. We pick on Craig Adams, and his fancy degree, out of love. Question: Are you up to something here? 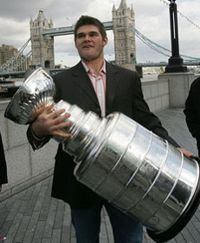 Like, maybe angling for Chris to drop by your place on the day he gets the Cup this summer? "To be honest, I'd be perfectly happy if all 29 of the other teams' planes were involved in a fiery mid-air collision, since I'm pretty sure that in a league with only one team the Leafs would have a decent chance of making the conference finals." The thing about the Bob Cole mispronunciation is that it will be made when he is supposed to be referring to a different Penguin. In other news, one of the headlines in The Metro today regarding the U.K. PM resigning was "Down Goes Brown." Looks like Downie has a fan at Toronto's 6th greatest daily newspaper. I cheer for Chris Kunitz cause I know him from college. GO FERRIS STATE BULLDOGS! All 29 teams, surely you could take the Rangers to a seventh game in the most unwatchable playoff series ever. "I'd be perfectly happy if all 29 of the other teams' planes were involved in a fiery mid-air collision, since I'm pretty sure that in a league with only one team the Leafs would have a decent chance of making the conference finals." Eh, I'd still take the rest of the field over Toronto in that scenario. "since I'm pretty sure that in a league with only one team the Leafs would have a decent chance of making the conference finals." They'd still miss the playoffs.